Hair Chalk is just so much fun. It is a quick and fun way to get really vibrant temporary color on your hair. It’s simple to do, inexpensive and washes out! Product received for review. The application is super easy. You just wet the chalk, rub on sections of hair, and then lightly comb and style. Beware, though, if you get the hair wet, the color will run onto whatever you are wearing. So plan on staying out of the rain! These chalks now come in a nifty little tin with a sliding lid so you can keep them anywhere without worrying about them getting anything dusty or cracking. Although, I crack mine on purpose. You don’t have to, I just like using a small amount at a time. Fun colors are really in right now, but why mess with permanent dyes? This is a great way to have some fun, but come home and wash it right out. That way when the trend is over, you won’t have lasting damage to your hair, either. Play around and experiment with different chalks and colors. My cousin and I played with hair chalk here. Have you tried hair chalk? What are your thoughts? I want to win so my girls can play with hair color without having to dye it. Perfect for 6 year olds! I want to win this because I’ve wanted some hair chalk ever since I saw a feature with Lauren Conrad where she used it. It looked so cute! And just look how beautiful their palettes are! I love the warm colors. I’d love to win this because I’ve always wanted to dye the tips of my hair but I don’t want it to be permanent! I’d love to win this for my friend She has 2 teen daughters that would love this. I’ve been itching to try the peacock look on one of my pinterest links! My daughter is on a soccer team and love doing crazy stuff to their hair when they’re in tournaments! I work on a ranch for girls and they would go crazy for this. It seems so fun. I love the glitter ones. I want to win because I used to have so much fun changing my hair color all the time. Now I’m older and a mom of two. I still can have fun but now it’s temporary!!!? pink bubble gum hair glitter. My kids would love this! I’d like to try it too!! I’ve been wanting to put some color in my hair, but I don’t want anything permanent so this would be perfect! I’ve been wanting to try funky colors but I don’t want anything permanent! What a neat idea and fun. I love that the chalk is really inexpensive, so you can try lads of different colors at one time, with traditional wash away colors it’s hard to do more than one or two. I’d love to win because I strongly discouraged my son from coloring his hair recently. This would make him happy….and me too! This would be great fo rmy nieces! My daughter would absolutely love this, and I’d probably have fun with it too. I want to win bc I’m donating my hair, and can’t color it and it’s driving me nuts! I would like to win this for my granddaughter because it is temporary color on her hair. I love making my hair wild and crazy, and I do it a lot with hair dye. It would be so much easier to just wet a piece of chalk and color it that way. And it would take a lot less time. I’d like to win because I want to color my hair but not for really longer than a day! I have pink and black hair and my 4 year old is always asking me to put color on her hair, so I would love to be able to with this!! 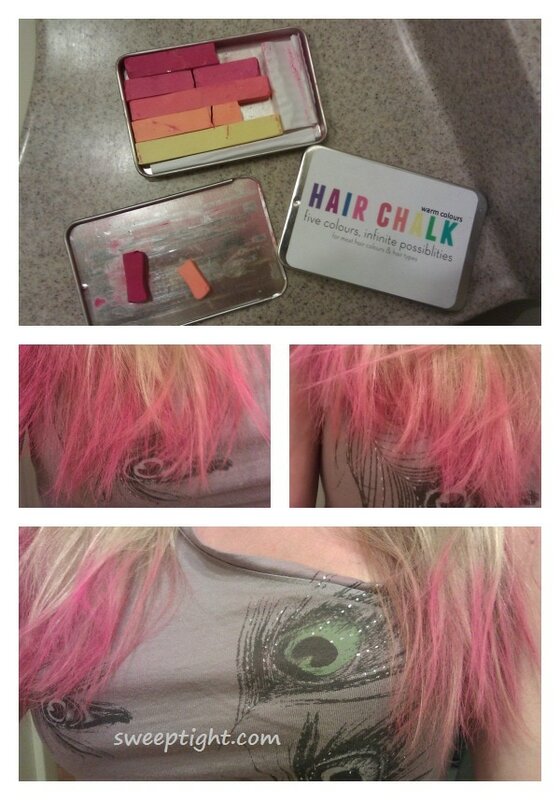 I have been wanting to try hair chalking since I saw it on pinterest in March. Getting it right in the mail would leave me with no reason to not try it. I would love to try this on my daughters! This looks like a fun product. Would love to win this because my daughter has been wanting to try hair chalk. I would like to win because it’s fun and color without commitment. Perfect for myself & my daughters. I would love to win because this looks like a fun product, and I want to try the Sky hair glitter. I would like to win because my teen daughters really want hair chalk. I want to win because this is really cute and my granddaughter would love to try some colorful hairstyles! I would love to win because I’m always going to events where I loveto stand out with TONS of bright colors, and having darker, somewhat fragile hair, I have never been able to dye it (it all snaps off) and would love the opportunity to change up my look with a few temporary highlights!! My son wants to color his hair blue, and I think this would be fun for him to experiment with! Because I want to be able to do temporary color on the weekends, since work doesn’t allow unnatural colors. I need something that easily washes out. I would love to try the vibrant colors on my hair. My hair doesn’t hold any hair products I’ve tried so far well… I love to dye my hair but it just doesn’t seem to last long, so doesn’t seem worth the money. I’d love to at least try these and see how my hair takes them. I love dying my hair and this is a great temporary option. My daughter would love this for her hair. My grand daughter would love to get this. Her and her friends would have a blast with it. I want to win this because my daughter has been begging me to let her dye her hair. This seems like a great alternative. I want to win because my daughter loves doing different things to her hair and would love these! I have really long (over 3 feet) red hair and have always been afraid to dye it… even with temporary dyes, since I fear that I’d have to cut it all off should the colour not totally rinse out. I’ve always wanted to try colour in my hair and these hair chalks would be a fun and risk-free way for me to do so. I love the opportunity to change my haircolor without damaging it. Id like to win to try it! i have naturally dark hair and would love to see if these would work for me, most hair coloring things just don’t show up! I’m always looking for something new to do with my hair. It’s so long that it doesn’t hold curls real well, and I don’t have the patience to do too much with it! This is a easy & fun way to try out wild colors. I know my grandkids would love to have these!! I want to win this for fun. It might be a little young for me but I want to try it anyway. Maybe send some to my daughter. Because it would (hopefully) fulfill my daughter’s desires to have rainbow hair!!! I want to win because i think it looks cool and my daughter would love this! I would love to win because I have really dark hair and would like to have some color sometimes, but I don’t want to have to bleach my hair first. I’d love to win because I want to try out a funky look, without committing to it. I want to win because this would be fun to try.. I would loooove to win! I can’t do permanent color, so this would be a sweet deal. this looks great to try and maybe have for halloween or parties! I want to win because it would delight my daughter. I have always wanted blue hair but never did it because of how badly it fades, this product sounds great. I like that it comes in so many colors. I have always wanted to put pink streaks in my hair, but I would have to bleach it first and I don’t want to do that. This looks way easier. Thank you! I have always wanted to try different colors in my hair. I would like to win this for my daughter because she’s always doing fun things with her hair! i like the primary chalk set. I would love to win this for my daughter. It would be fun when we play dress up without being permanent! I’d love to have some cute hair for the last summer hurrah! I want to win because this looks very nice!